In cold winter when people more shrink back in mind due to the economic downturn, those who have warm hearts perform a miracle by making a united effort. 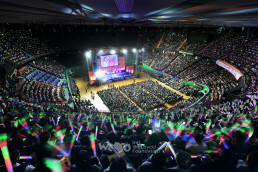 An event was held to look after our neighbors and to close the year 2011 beautifully at the Suwon Gymnasium on December 19. 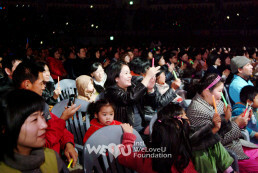 To help children with disease, low-income families and multicultural families, the 12th New Life Concert began at 7 p.m., being attended by over 9,000 WeLoveU foundation members and citizens. It was hosted by the Intl. 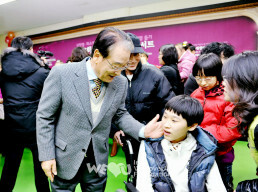 WeLoveU Foundation and sponsored by Seoul Metropolitan City, Gyeonggi Province, Suwon City and Sejong General Hospital. 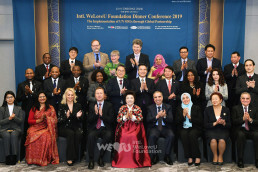 In this event, people from all walks of life such as foreign envoys in Korea, local government heads, government officials in charge of social welfare as well as Chairwoman Zahng Gil-jah and Director Lee Gang-min participated with the foundation members. Although celebrities were very busy at the end of the year, the members of the cast—Sponsor Chairman Lee Sun-jae (actor), Goodwill Ambassador Kim Seong-hwan (actor), PR Ambassador Lee Seung-hun (vocalist), Kim Hyeung-guk (vocalist), Baek Mi-hyeon (vocalist), Kim Jae-hun (vocalist), Yun Tae-gyu (vocalist), Im Chang-jae (vocalist), etc. came to this meaningful event and willingly brightened up the stage, setting aside their other schedules. 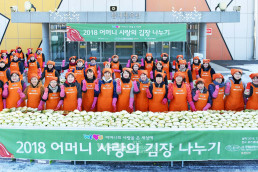 Foreign embassies in Korea highly appreciated the international activities of the WeLoveU Foundation for helping foreign countries suffering from water shortage, and wished the foundation to continue to help the world suffering from many disasters. 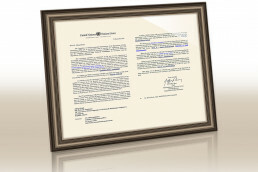 Gyeonggi Province Governor Kim Mun-su sent a congratulatory video message encouraging the members. That day, medical and living expenses were delivered with gifts to 40 families―low-income families and multicultural families including children with rare disease. While Chairwoman Zahng Gil-jah and Sponsor Chairman Lee Sun-jae were warmly encouraging the families who had hard times and delivering hopeful messages along with medical and living expenses to them, the WeLoveU members gave a big applause with love. The donations are supposed to be used to support children in Nepal and Cambodia, too. Donation Delivery Ceremony presenting medical and living expenses to our neighbors in need. In the second part―the New Life Concert, the stage for beneficiaries and the WeLoveU Foundation members was opened by a witty host Kim Seong-hwan and with cheerful dance of the New Life Children’s Choir. The concert presented joy and emotion with the message of hope: Lee Seung-hun, Baek Mi-hyeon and Kim Jae-hun displayed soft and emotional performance; Kim Heung-guk, Kim Seong-hwan and Yun Tae-gyu showed exciting and passionate performance; and Im Chang-je sang the song of memories. All these received the enthusiastic welcome from the audience. Kim Heung-guk who delivered the message of encouragement to the audience, said, “Although the songs and laughter we deliver are only crumb of comfort, if each and every one comes together, it will be a great encouragement.” He presented a big laughter through his passionate dance. At the end of the concert, vocalist Im Chang-jae said, “All you here are the people who give and receive with heart, and share love with heart.” The songs of love, sung by those who chose the valuable life that considers their neighbors in need more than themselves, were welling up in all their hearts as bright and powerful energy that engraves love and hope in them and fulfills dreams.